This tri-panel Silhouette has a tissue painted background. Water is brushed over colored tissue paper and then removed. We used torn pieces of tissue paper, rather than cut squares, to give the painting a sunset appearance. This project was so much fun because we discovered so many different colors when we over lapped the tissue pieces. Although I have this as a 4th Grade project, it’s appropriate for other classes as well. 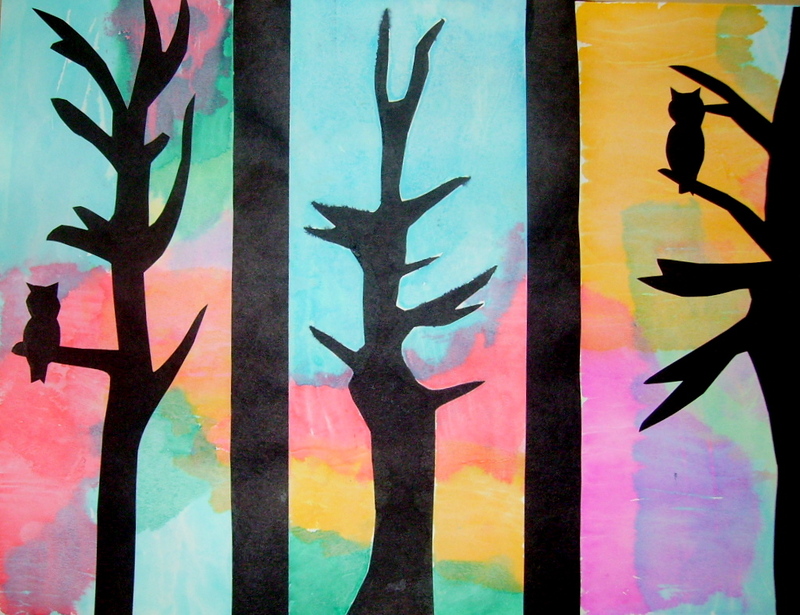 You’ll find the directions for “Tri-panel Silhouette,” in the 4th Grade Projects Gallery in the sidebar. This entry was posted in 4th Grade and tagged 4th grade, arts and crafts for children, classroom art for kids, easy tissue painting art for kids, silhouette art, tissue paper, tissue paper painting, tissue paper painting art for kids, tri-panel silhouette. Bookmark the permalink.